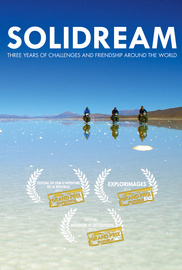 Childhood friends decide to pursue their dream to go around the world and cycle 54,000 km, full of unusual challenges. Leaving with the original idea of reaching extreme parts of the globe, they face the aridity of Atacama and Australian desert, sail in the Furious Fifties and down to Antarctica, suffer from the dampness of the Amazon jungle, build a raft to paddle down the Yukon River and cross the high Bolivian plateau and the Tian Shan Mountains of Kyrgyzstan. During three years, ordeals and encounters reveal the unpredictable past of some of them. Along the road, they will learn the greatness of mankind.